Thanks to the support of the community and the commitment of friends, volunteers and donors, we have had a very successful year. Our GCA productions—Little Prince, Sweeney Todd, Animal Crackers—received rave notices and played to large, appreciative audiences. Our Live Playwrights Society, through which talented local writers can bring their plays to Short Attention Span Theater, continues to thrive. Our engagement with the community—through Open Mic nights, educational outreach, partnerships with Mainstay in Rock Hall and the Kent County Arts Council—remains strong. Our devotion to bringing the performing arts to children through Playmakers, Youth Choir and MUSICAMP is one of the foundations of our mission. Thank YOU for making this possible! Over the last six years, we have seen significant increases in our revenue from our events and productions, but we still have tremendous needs. 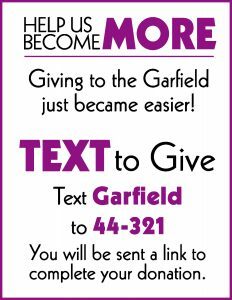 Individual donors like you contribute one out of every five dollars raised for the Garfield. Please consider making a generous year-end donation to the Garfield to ensure that we can continue to create inspiring shows and events, offer free programming and scholarships, and connect artists and audiences in meaningful ways. And help us celebrate the theater’s 90th birthday! Every donation will have a significant impact. (Perhaps a $90 gift to support our birthday!). There is nothing like the excitement, inspiration, and joy on the faces of our patrons, and especially the children who participate in our camps, events, and theatrical performances here at the Garfield. The transformative potential of the performing arts is part of the very fiber of the GCA. Making these moments possible is what we are passionate about. Please help us as we continue to nurture, celebrate, and support arts and artists through performance and education by making a gift today. Thank you for your support of our mission and for being such an important part of the Garfield. P.S. – Your gift, large or small, is deeply appreciated and will help more people of all different ages and backgrounds experience the magic of theatre at the Garfield. Thank you. Make a donation today by clicking on the PayPal button below or print out and complete our DONATION FORM. or print out and complete our donation_form. Volunteer – we are always looking for volunteers both on and off stage. Visit our Volunteer page to find out more. 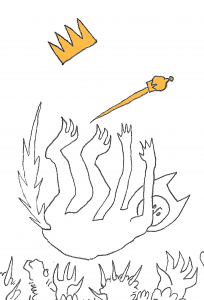 Amazon Smile – use this link to make the Garfield your Amazon Smile non-profit organization! Sponsorship Opportunities – we are always looking for sponsors for our events. Visit our Sponsorship page or call 410.810.2060 to discuss sponsorship opportunities. Playmakers Scholarships -There are many children in our community who would like to participate in Playmakers’ Summer Camp, but cannot afford to do so. For $500 you can sponsor a Playmaker for the entire summer camp experience! Donations for partial scholarships are also encouraged. Program Book Ads – there are many opportunities throughout the year to place an ad in our program books and we offer ad sizes for every budget. Visit our Program Book Ads page for more information. Please take a minute to complete our form below and someone from our organization will be in touch. Thank you!